I always describe this one. From the first moment I tasted it, it earned itself a special place in the crevices of my mind. 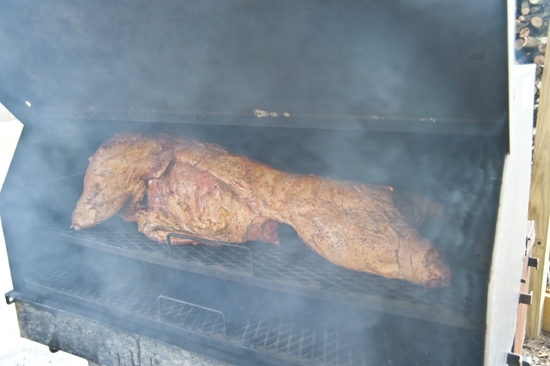 This is a whole wild hog, marinated for days and then smoked for many hours. There is also bacon and apples and molasses involved. As my friend in Arkansas always says, what’s essential in this recipe is how it is killed, where it is shot, how it is dressed and cleaned. All of that needs to be done in an impeccable way. Cleanliness can be helped with a good marinade that includes a lot of acid in the form of: vinegar, olive oil, lemon juice, and orange juice in any combination. The size of your pig will vary and so you have to rely on intuition when it comes to how much to use. You can marinate for 1 to 8 days. Acid cleans it, but it also imparts flavor. You can marinate it in an ice chest if your pig is up to about 80 pounds on the hoof or 45 pounds cleaned. Or you could even use a garbage bag. The time it will smoke varies depending on the size as well. It could be six hours, it could be twelve. The temperature shouldn’t go above 250 degrees F in your smoker… and it’s best to get the coals going before you put the hog in to create even radiant heat. My friends in Arkansas recommend The Good One cooker. I’ve never tasted anything from there that hasn’t been delicious. What should you use to heat the smoker? Well, you can do it with charcoal, but pecan wood is best if you have it in your neck of the woods. OR use a tree indigenous to your area. In the Southwest it’s mesquite, in Washington state it’s apple wood, in the Midwest it’s the hickory tree. The densest, deepest part needs to be 160 degrees F. Under the front shoulder is usually the coolest part. But don’t forget the best part…when it is at about 140 degrees F, add a pan of apples to the bottom of the smoker. They will begin to steam from the bottom up. 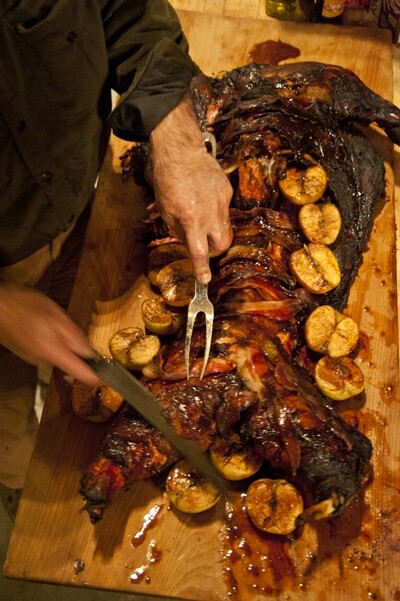 Then blanket the back of the hog with strips of bacon and cover it with molasses, which will drip down on the apples. Be generous with the molasses and pour most of it where it will drip down into the pan of apples. Sprinkle a bit of cinnamon on the apples for good measure. Then you serve it on a big cutting board. It is your piece de resistance. People will love you forever. You and and your hog will have a permanent place in their minds and hearts. Here is a pig from years past. 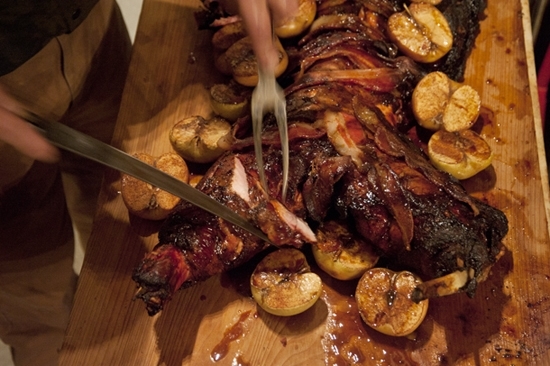 Here is a recipe for some killer apple juice smoked ribs. Here are directions on how to skin a pig. Here are directions on how to butcher a pig. "Marinated and Smoked Whole Hog"
Marinate for 1 to 8 days. A hog that is 80 pounds on the hoof, 45 pounds cleaned, will fit well in a standard cooler. The acid cleans the meat, which is important when cooking. When ready to smoke, bring the wood coals to no more than 250 degrees F in a large smoker. Use a wood that is indigenous to your area. Pecan is great, so is mesquite, apple wood and hickory. Let the coals become nice and uniform so that you have even radiant heat. Smoke the hog from 6 to 12 hours, depending on its size. Once the densest part of the hog reaches 140 degrees F, add a pan of apples to the bottom of the smoker, sprinkle with cinnamon, and let them steam up under the hog. 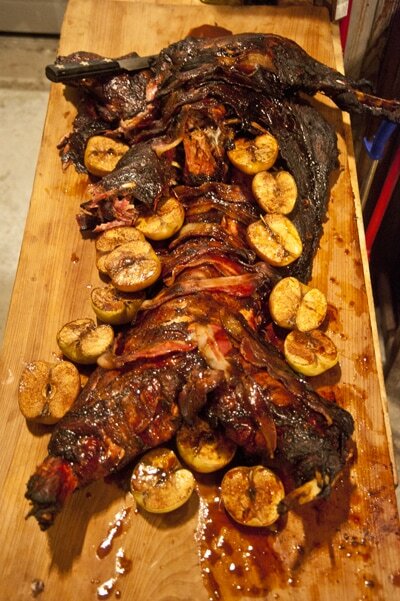 At this point, also blanket the back of the hog with bacon and pour on 2-4 cups of molasses. Be generous with it and pour most of it in the area where it will drip down into the pan of apples. The hog is ready to serve when the densest, deepest part is 160 degrees F. Under the front shoulder is usually the coolest part to test. Serve immediately table side as your piece de resistance. It is really not as expensive as it sounds. A whole hog from a butcher is actually cheaper as there is not as much work that the butcher needs to do to sell it. Check with you local butcher for pricing, you can also do 1/2 of a hog if you do not have that many people. I am glad you enjoyed it, thank you. fulcrum unknown to me heretofore. Wow, I had no idea you could use your marinade to actually clean the pig, like you said with acidity – I mean it makes sense, I just never thought about it. 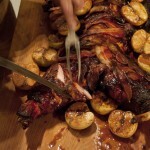 Also, I love applewood smoked bacon, a whole hog smoked over applewood sounds divine! I marinaded mine in pinapple juice, orange juice and apple juice and then used a good rub and then smoked it and after that some of it went into a crock pot for bbq. The pig came out just right. 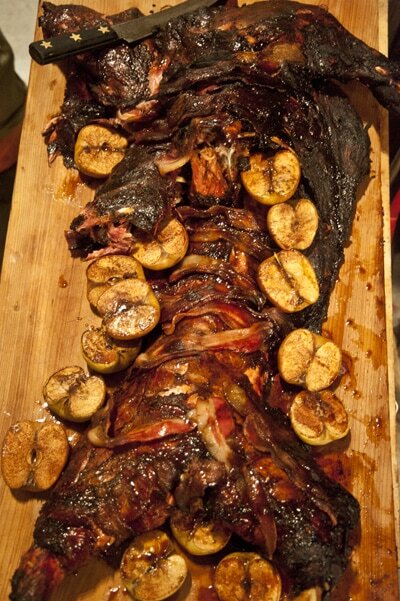 One other way to cook a whole hog…….leaves plenty of time for fellowship and time around the fire. Hog needs to be less than 80 lbs live weight. Clean it, spread it flat (may have to break the ribs with a hatchet or similar tool), put a rod through the front shoulders and rear hams (to hold it flat), then wrap it in a clean pc of wire (meat will be tender and could fall off without the wire). Hang and cook over an open fire for one to two hours. Remove from the flames, checkerboard the muscles with a knife, and season with salt, pepper, etc. Put the wire back on and continue to cook until done. Usually takes all day. Alternate hanging from the top or bottom, rotate from front to back, and move away from the heat if the fire becomes too hot. Oak, hickory, pecan, or all of the above works. Try it sometime. Turkey cooked the same way is delicious too. 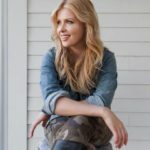 mY HUSBAND KILLED A HOG AND WE WANTED TO USE YOUR RECIPE……iT LOOKS DELICIOUS!! yOUR RECIPES ARE ALWAYS SO GREAT!!! Quick Question….what kind of smokers do you recommend? dESCRIPTION OF gRILL? dO WE NEED TO GO OUT AND BUY ONE….. Could you use a weber little smokie grill? wHEN WE SMOKE TURKEY, WE USE OUR WEBER gRILL….WOULD THAT WORK? ps WILL YOU BE DOING ANOTHER MODERN PIONEERING WORKSHOP IN THE SPRING? I HAD SO MUCH FUN AT THE ONE IN BOERNE!! I have a “big green egg.” But you could also use a Weber if you have low heat coals going and a pan of wood smoking chips. I don’t have experience with the Weber though but if it works for your turkey it will work for a wild hog, congrats to your husband! And yes, we’re working on putting together another Modern Pioneering workshop for the spring! thanks Georgia for the info!! I can’t wait to use this recipe! and I will definitely come to the spring workshop!! What do you do about refrigerating the meat while marinating in the cooler? Does the marinade keep the meat from growing bacteria or do you add ice to the mixture? You either want to keep the cooler in a walk in cooler, or put ice in the cooler and the pig in a garbage bag then in the ice. I cooked it yesterday and it came out amazing. People were practically licking their plates. I cooked 3 30lb shoals in a large grill/smoker and it took exactly 6 hours. Thank you for taking the time and replying to me.